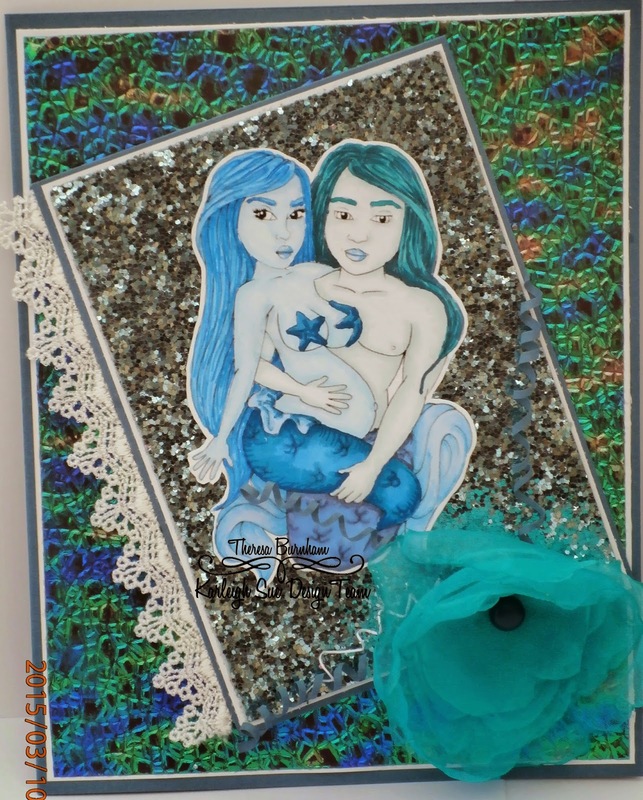 Top secret digi release can now be revealed - below are my 2 versions of 1 of the new mermaid images at Karleigh Sue. I used a scallop shell template to make the front of the card. Brushed Pearlex over it (doesnt show well in the photo) to give it a shell like finish - then sprayed with hairspray to seal it. Layered the inside of the card with some paper from JeJe from my stash. I used some glossy accents to make bubbles. I mat and layered some water effect papers that I found in my stash. And made a turquoise flower from some Tulle. Super card, great background & design! Beautiful! Thank you for sharing with us at Eclectic Ellapu Pink Team Challenge.